This is a commission I did recently featuring two members of the warring factions from Caravan Palace’s music video to Lone Digger. I remember first seeing this video a year or two ago and liking it, but I probably would’ve never done any art based on it if I hadn’t been commissioned to like this. I tried my best to match the style of the music video, which presented some unique challenges, but overall I’m pretty satisfied with the end result. Here’s another Character Ask, this one directed at Riley. I’ve only ever drawn Riley through commissions so far, but I’d like to do more with him and Huey some day. 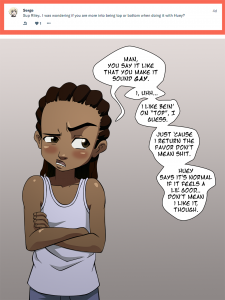 There should be more Boondocks stuff around here eventually; I’m currently working on another commission from the series, plus the next MomSwap entry is gonna be Boondocks. As for this Ask, it seems Riley’s still not entirely comfortable talking about or even acknowledging the things he and Huey get up to behind closed doors. Maybe some day he can break free from that. So I know it’s been a minute, but I finally got the second entry in the “Trap Sluts” series wrapped up. These ones take a little while, especially when I’m focused on other projects, but I hope they’re worth the wait. This one features Robin, leader of the Teen Titans, partaking in a different sort of nighttime escapade than we usually see him doing. His design here is partially inspired by some feminization fetish pics I saw of him a long time ago (the ponytail and hoop earrings, mostly), while the outfit’s based on different “slutty” versions of the Robin outfit I’ve seen worn by cosplayers and the like. I’m pretty happy with how this one turned out, and I hope you guys like it, too. Eventually there will probably be a Beast Boy entry in this series, though I don’t know yet if any other characters from this show will be showing up. I don’t want to do two entries in a row for this series from the same show, but I know how much people like my Dragon Ball stuff. To compromise, early on we’re probably going to see every other entry be a Dragon Ball trap, ’cause I have at least five planned off the top of my head (maybe more, I’m not sure yet). The next entry will be one of these, so somewhere down the line that’ll be going public. Here’s another question aimed at Deku-kun. 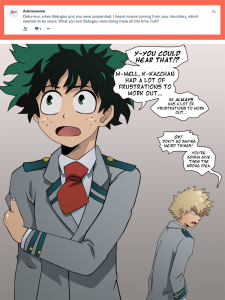 I feel like this question was asked in the hopes of seeing a certain thing, but the way it was phrased and the way I approach these asks I couldn’t think of a way to deliver that (part of the problem was that it was referring to an event in the past, rather than something Deku could demonstrate like in his other Ask). Instead this is the most in-character response I could think of, and I hope it’ll be satisfying enough. Perhaps like with Mace and Jackie’s first Ask, it’ll lead to something more later on down the line. This is the third and final entry in the “Gotham Academy Tentacles” series, purchased through my Epic Level Patreon tier. The client asked for a clean and messy version, and I ended up doing a middle one where the tentacles (and the girls nether regions) were sticky, but nothing else. I hope people have enjoyed these pics, as the client has expressed plans to do more with these characters at some point in the future.